Today's card is the Three of Cups, a card of celebration and joy. This card comes from my brand new deck, the Legacy of the Divine Tarot by Ciro Marchetti. I LOVE this deck! The suit of Cups is about emotions and feelings, while Threes deal with creation, growth and expansion. 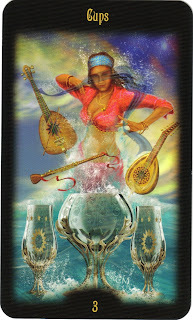 The energy of the Three of Cups is about bringing people together for fun and celebration. This could be a small intimate gathering with a few close friends all the way up to a large party (wedding, births, baptisms...large, fun gatherings). "My own theme for three is group activities, and with Cups that becomes emotional bonds...The healing power of this card would be around friendships." Think about your most precious and healthy friendships and feel the loving energy that surrounds you when you think about them and are with them. That is the best way to describe and feel the energy of the Three of Cups. I have a handful of people who I consider my very closest of friends...and several of them are related to me! These are people I trust -- there are no hidden agendas, we support and listen to each other equally, we enjoy similar activities and have found each other on this path at this time (however long that is) for a reason. I cherish these people and our friendships. As I described the qualities of my closest friendships, what would you add to the list? Who comes to mind for you? The Three of Cups is a reminder to be with the people you love and enjoy. If you don't think you have a cause to celebrate...make one up! It's easy to get caught up in the busyness of life and forget about having fun. Today, decide who you'd like to spend time with to celebrate and have fun. Set up a time to get together in the next couple of weeks and revel in the energy of the Three of Cups. Three of us celebrate being in a Master Mind Group. The Three of Cups says it all! LOVE THIS DECK!!! Beautiful images. I want physical cups like that. Just before coming here to see today's card, I was replying to a dinner and game night invitation we'd received by a couple who are very dear to me, and I haven't seen in while - how perfect was that?!?!? The dinner is next month - however I was sooo delighted by the invitation now... it lite me up. All I could think about as I read this was that I have my first therapy appointment today. I certainly hope that through this relationship I will experience creation, growth and expansion as I deal with my emotions and feelings. I also know that a therapist is not a "friend" in the traditional sense, but as a professional myself, I know that the therapeutic bond and that relationship can serve a healing purpose. I'm also feeling more inspired to connect with my good friends, whom I cherish more than anything. I've had a busy day, too. But it's important to take a few minutes to take care of my friends, even if the only place I can do it is via social media. I'm so, so, so blessed that I, too, am related to some of my very best, most unconditional friends. You know who you are and I'm so glad we are on this path together! Thanks, Sheri, for bringing the energy of such a fun card. Phew! thank sheri! you've pulled just the right card as usual. i always read this late in the day as my tuesdays are usually full as you know... but i was just thinking about the tarot tarts and my home tomorrow and really looking forward to spending this time with some of my favourite women...when i read your reading for today... how appropriate this card is once again. i, too, am blessed with family members that are truly best friends as well. i celebrate life and love every day of my life. thanks for once again pulling the perfect card!!! Well in less than two weeks I'll be 50 and I've decided to throw myself a birthday party. So this card will be on my mind as I am inviting people and thinking about what I want the party to be like. When you described those very close friends I thought of three people, none of whom live close by, the closest is a three hour drive. I want my party to have the 3 of cups energy, as you've described it, that feel of unconditional friendship. So we'll see how it turns out. To add to this list yesterday I also received 2 lunch invitation, another invitation to get together with a friend, and a another dinner invite - this is all in one day - not the norm for me :) All these invitations are coming from people I enjoy, apprecitate and find value in sharing time with. I am blown away at how this card reflects my life on the day it was pulled - amazing!! Yeah, this card really exudes "party!"vibes. I'm thinking that the vibe of this card can encompass the more sorrowful end of the spectrum too. I come to this conclusion in thinking about the circumstances of my own life--deaths, marriages of friends breaking up, my own marriage, and on the surface that doesn't say, 'party.' However, these have been opportunities to connect more deeply with my friends and feel reassured at the nature of the bonds between us. I'm not sure I had read this post yesterday when a friend called to ask if she could call me that night to talk. I had an appointment and would be driving by her house afterward and so stopped over instead. Guess that's 3 of cups energy! I have two friends that I can always count on. So there are three of us. Cool. For some reason this JUST came through in my Reader. Thursday's, too. It's clear who my 2 other cups are. I laugh with them, sing with them, bend with them, punch with them, travel with them, party with them. Love the energy of this card! Teenage Brains Part 1: Always on Spring Break! Perfect Moment Monday -- Holiday Outings!